West Ham have sold Alessandro Diamanti to Brescia for 2.2m euros (£1.8m). The 27-year-old forward cost the Upton Park club £6m when they signed him from Livorno in August 2009. 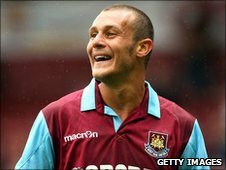 He scored eight goals in 29 games for the Hammers in the 2009-2010 season but has played only 17 minutes of Avram Grant's first two games as manager. West Ham said in a statement that the sale of Diamanti would "release space in the squad for another player to be brought in". Brescia won the last promotion spot to Serie A after winning a play-off against Torino at the end of last season. Should they do enough this season to remain in Italy's top flight for another term, another 300,000 euros (£245,000) will be payable to West Ham. I assume that 2.2m must be worth about £8m? I'm not really up on exchange rates. Well done - nice little profit there. Please note sarcasm may be found in this article. The Hammers added: "Diamanti faced stiff competition for a first-team place with the arrivals of Pablo Barrera, Thomas Hitzlsperger and Frederic Piquionne." The club concluded its media release by revealing it "could unveil more exciting new faces before the transfer window shuts [on 31 August]". West Ham, with no points from their first two Premier League games this season, have been linked with a move for Lorient striker Kevin Gameiro.